Bovines have a ruminant digestive system allowing them to extract nutrition from grass-based food sources in a way humans simply cannot. While bovines are regularly referred to as having "four stomachs" in their ruminant digestive system, this statement is erroneous. Bovines have a stomach with four "compartments" -- each performing its own segment of the digestive process allowing bovines to "eat" and receive nutrition from fiber-dense food sources. Bovines enjoy munching on fresh grass in pastures. With large herds, the movement of bovines across a field can destroy grass causing farmers to opt to keep the bovines in a paddock area, cut the grass and bring it via a large feeder wagon to the cows. The Backwoods Home Magazine recommends a combination of alfalfa, brome and timothy grasses to grow a grass crop bovines like to eat to provide appropriate nutrition. This product is made from grass that is cut in the field and left to dry before being baled by a mechanized farm implement hooked behind a tractor called a baler. Hay is often fed during winter months when fresh grass is not readily available. The U.S. 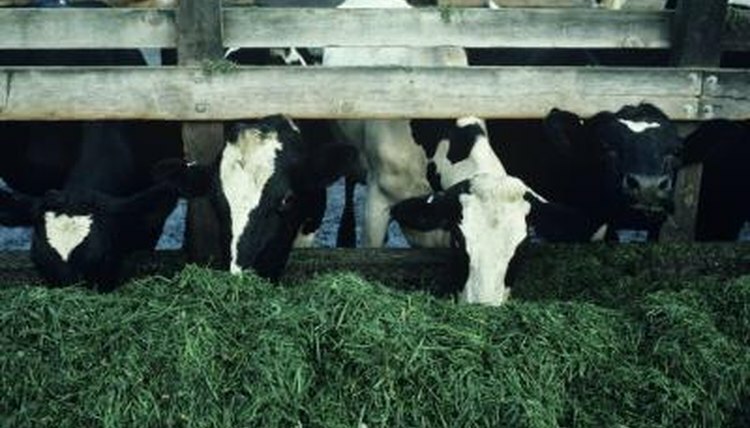 Dairy Forage Research Center explains that dried alfalfa grass is a popular option for hay. Dried alfalfa retains leaf content -- the part of the plant where nutrients bovines need are stored. This product -- also fed to bovines in winter -- can be made of grass, but is also made from corn and other legumes. Unlike hay, silage is not dried. Instead, it is harvested from the field, kept wet and chopped into smaller pieces for storage in a silo or an underground bunker where it will ferment. Farmers often cover silage with molasses to improve its taste. Grains as fed to bovines are a combination of the seeds from various cereal crops. Grain mixtures can contain seeds from corn, barley, wheat, rye, oats and rice. Bovine beef cattle are often fed grains in the last few months of their lives to improve what will be the flavor of their meat after slaughter. Female dairy bovine cattle are often fed grains because their high energy content helps them produce more milk. Some of what humans reject as undesirable food is perfectly acceptable to cows, such as the rinds from pineapples, cantaloupe, watermelon and citrus fruit. Bakery byproducts and brewer's yeast -- which is high in vitamin B -- is also fed to bovines. Wild bovines such as the American and European bison, Asian water buffalo and African or Cape buffalo rely primarily on grass as their food source when living on the free range. When kept in zoos, these types of bovines are fed a high-fiber pellet and hay made from Bermuda or Sudan grasses and given access to a salt and mineral lick block. Wild cattle will eat some flowers and white clover, according to Illinois Wildflowers. The Dairy Mom: Dairy Diet - What Do Cows Eat? U.S. Dairy Forage Research Center: What Do Dairy Cows Eat? What Type of Hay Should I Give My Guinea Pigs? What Kind of Habitat Do Cows Live In? What Would Cause a Cow to Regurgitate Its Cud? What Kinds of Hay Do Horses Eat?